Michelangelo Buonarroti was the father of the Florentine Renaissance. His techniques forever changed the way that artists, especially sculptors, would approach their craft and his art left an indelible mark on future eras. In our three-hour walk, we will follow the life and career of Michelangelo during his Florentine sojourn, discussing his early years and career under the patronage of the Medici family. 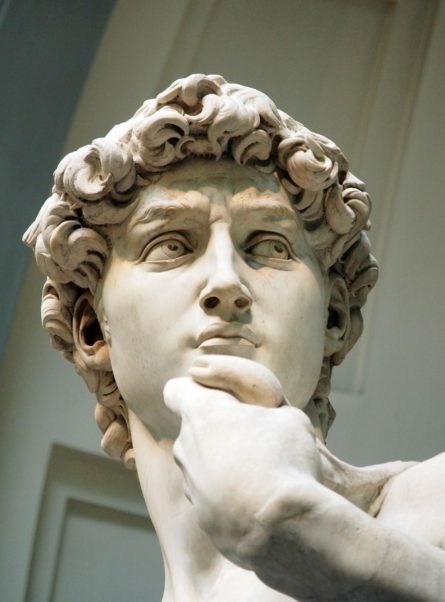 During your tour, an expert guide will lead you through the Bargello Museum, Accademia Gallery, and Santa Croce church to gain insight into the life and art of Michelangelo Buonarroti. Explore his early work at the Bargello Museum, where you will also see work by Donatello and Brunelleschi. After taking in the iconic David at the Accademia Gallery, as well as his late Slave sculptures, you will end your time at Michelangelo’s tomb in the church of Santa Croce. You will come away from this private tour with a deepened appreciation for Michelangelo, having examined carefully his life and art. Looking through the lens of his patrons and peers, his legacy in history will take form. We will also explore his influences and see how they impacted his artistic output, surely one of the greatest in all of art history. This Michelangelo tour in Florence lays the foundation to understand the master’s other, later, work in Rome, like the Sistine Chapel.